Home » Uncategorized » Ouija Board – Yes or No? 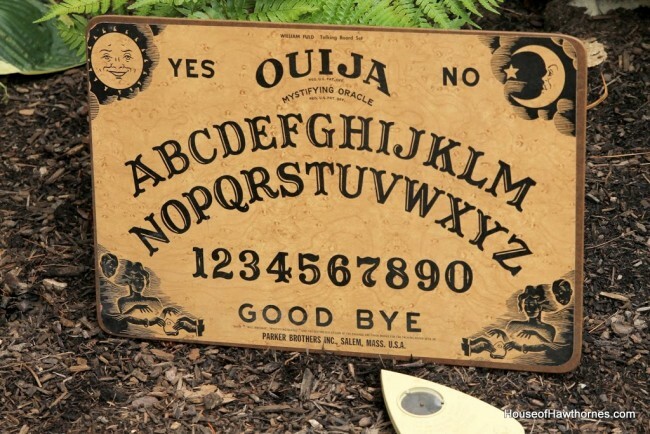 Ouija Board – Yes or No? I was out garage saling the other day and ran across this ouija board. The tan and black graphics jumped right out at me and I immediately had thoughts of using it in my Halloween decor. Maybe two skeletons playing with it while sitting on the black rockers on my front porch? Spooky ghost over head? It doesn’t exactly match my normal pumpkins and cornstalks fall front porch themes, now does it. But on the drive home, I started to get the heebie jeebies about buying it. Do you believe they bring bad vibes into your house? And I’m only asking because my washer died a mere 2 days after I brought this instrument of evil fun little game into my life. What’s your thought? Should I toss it in the trash and save myself from any other appliance disasters or just use it as a fun prop? Linking with Southern Hospitality’s Thrifty Treasures and Coastal Charm’s Nifty Thrifty Tuesday. I think its bad karma, but thats just me. Love it. Keep it. I can’t wait to start bringing out the Halloween decor later this fall. I think it would make a great piece of Halloween decor! I think it is a great decoration. I don’t believe in bad vibes. How old was your washer? Just sayin’ . . . I would love to say keep it–cuz it does look neat. But seriously, I watch way too much paranormal television I will admit, but this thing is nothing to fool around with. I would be afraid to even be in the presence of one of those boards, and personally I wouldn’t just throw it away. I don’t know what I would do exactly but I would look up on the internet how to properly dispose of it. Just the other night on “Haunted Collector” some people had a whole bunch of terrible things happening to them and the haunted collector guy found a broken board in the attic. After removal everything was fine. Better safe than sorry. If you do put it up and have trick or treaters running away, you’ll know why:) Maybe you’ll save money on candy. Pair it up with a young, hip FUN gypsy fortune teller. If it is connection to the spirit world and has amazing power, then it can be a tool for good and love. I pick up (rescue) any that I can find. The graphics on the older ones are even more amazing. I also look for tarot cards and crystal balls. If you find you do not want it I know it is the perfect size to make a French bulletin board from, and very sturdy. Creative energy. Would look great for Halloween. BUT…if it gives you the creeps, pass it on to another! Keep it!! I think the karma thing came from the 70’s and I consider having one good luck:) I have one of the older ones and use it as a mouse pad under my computer. I do so love these. Got one at auction last year to sell and then I just could not part with it. Love them for Halloween. No bad vibes as of yet, she said while knocking on wood! I have one in my Halloween decorations and I love it. If you decide it’s not for you – they do sell on ebay for $100+. That would help pay for the new washer! Ohhhhh….I love it! And your porch idea – fun!! Or, as another suggested, put a gypsy fortune teller with it. I have to admit – one of my favorite high school slumber party memories involves a Ouija board, late at night, lights off – oh, the hearts that stopped when a light flashed in the windows! I have always wanted one but after reading the comments here, I might change my mind. I would have never thought about this before you brought it up… undecided. I have never subscribed to the old karma thing. It’s a piece of manufactured wood or whatever and nothing evil about it. I think it would make a totally awesome decoration and fun. If you don’t want it I’ll certainly be glad to take it off your hands as would probably a hundred other people. Use it and have fun with it. That’s all it was ever meant for in the first place! It would make a wonderful display for Halloween, but I say toss it. Awesome! I think it’s super cool…I would keep it! I’m sure that you would find a really cool display idea for it. A friend of mine actually had a birthday cake that was made to look like a Ouija board because she loved the game so much as a teen. I think they are fun…and harmless. Would probably burn it so I wouldn’t pass along bad to someone else who was unaware. They creep me out. FUN prop complete with skeletons. Hopefully the bad luck is behind you. Just a coincidence. take care. I’m not usually superstituous, but just one more “bad” event and I’d have to get rid of it! I like the comment about selling it to pay for the washer! I don’t know but I’m not chancing it! It’s not worth the risk to invite bad spirits into your home. My mom scared me soooo bad when I was little with warnings about playing with an Ouija board. (sckeeery) I love the graphics though! I think it makes cute Halloween decor. I played with one of these once as a child and I still get chills with what it said…. toss it, ….there are evil beings in this world just like they are angels. These are portals to that bad energy, no doubt about it. ASk the board what you should do. Never heard of them being evil but sounds like some have had some experiences. If you have the heebie jeebies then perhaps it’s not meant to stay with you but rather you are the vehicle it hitchhiked with before it gets to its proper destination. I would tie a pretty orange ribbon on it, place some candy corn in the planchette and sell it. Someone will love it and take it home and both and everyone will be happy, including the board. Well that’s a tough question to answer. It makes a cool looking decoration for sure but I’m thinking if you feel “heebie jeebies” about having it then perhaps it’s best to not have it around. It was made in a factory out of printed paper and cardboard, just like a Scrabble board, or Chutes and Ladders… How do paper and cardboard = bad vibes, karma or evil spirits??? Maybe if you get a Scrabble board and put it in your house, your vocabulary will suddenly increase, too. (Insert music from Twilight Zone here) Pffft. Have fun with it at Halloween! Keep it. Just don’t use it as intended!We played with those so much in jr. high, nothing ever happened that I know of, but as an adult, they creep me out. I think anything can invite evil in, if that is one’s intention. Keep it, it’s fabulous for Halloween! I can’t help myself–had to come and see what other people have said. I am amazed at how many people do not believe in the evil they can have connected with them. They can be a way for good spirits to contact you too but who wants to take the chance. I have made my kids listen to the stories about them on a show I once watched and I think I have scared them into never touching one. They are just a board and paper but they were created for the purpose of contacting the deceased. That gives them a different energy than other board games. You could put your skeltons out playing the game of life or something–that is scary enough–LOL I don’t think your washer breaking has anything to do with it though. I would expect things much more evil than that. If you do keep it please don’t play with it–at least! Evil spirits have an easier time possessing disabled kids and so I always have a huge fear of that. I know I may be over-reacting. I tend to do that sometimes. Evil spirits can attach to anything–especially all the old stuff we love–so where to draw the line is hard to know. I actually have not bought some really cool things at times because I felt like I got a bad feeling from them. I’m weird. Burn it. The graphics are neat because they are vintage, but it’s not worth it. The Catholic Church condemns playing around with such things. In college, I made the mistake of playing around one bored night with some friends thinking it was just phony. I was wrong. NEVER AGAIN. What if one comes around and doesn’t want to leave. Keep it away from your family. I only do autumn decor now, not scary. I don’t even like horror films anymore. Some things you just don’t need in your head. PS…If it is making you uncomforatble, that is your guardian angel telling you to get rid of it. Don’t sell it and make money; that just invites someone else to partake in the wickedness it offers and maybe lose their soul. You don’t want to be responsible for facilitating that. keep it! it would be PERFECT halloween decor, and, things are only “jinxed/evil, etc” if you LET them be … it’s just like black cats, etc. It’s a game manufactured in mass quantities by a toy company. don’t feed the hype! I vote to burn it… the spirit world is real and folks utilize those to reach it. I’m sure your creativity will be much better than some wooden board. TOSS IT. No question about it. As a Christian, I know it is related to Satan. Oh, keep it! It will make a fun Halloween prop….unless of course your car breaks down tomorrow. I’m back…lol. I am wondering..are these produced in quanity by toy suppliers? Because if so how come they are sold for so much on ebay? Did you realize this post would get so much attention? I totally believe in good and evil. I would toss it. It invites evil spirits into your home. I had one of these as a child. We played with them at spend the night parties. Nothing bad happened, but I would still toss it. Keep it and see what happens. If your luck suddenly decreases you know who to blame. Seems like your dishwasher is casualty number 1. I’d say No. I had one as a child, and it told me things. My grandma wouldn’t let me bring it to her house: “The devil is in it”. And now as an adult, I do believe in both good and evil, God and the devil. And I can tell you that it isn’t God moving the Ouija board. But all in all, it’s your call. I remember playing with this as a young child with my sisters and it’s a fond and harmless memory. I bought one last year at a garage sale and used it as I will this year too in my decor for fall. Keep it! Cute idea to use it as a Halloween decoration. I say go for it. We had one when I was a kid. My parents would have forbidden “playing” with it as an Ouija board, but they never minded us using it as a sled in the snow. And no sled riding accidents occurred! I’d say get rid of it. Why chance it? No thing is more important than you and your family! I too (like Shabby Chic Sandy) have been looking around in resale shops/antique shops and have gotten a very weird feeling on certain things. My mom found a wooden bed frame, very pretty, but as soon as she showed it to my sister and I were both immediately said, no! It totally gave us both a weird feeling. Just my opinion though. I think we are given these little feelings for a reason. Just like when we meet someone and they creep us out….there’s a reason. Wow, lots of responses on this one! Honestly, I see both sides of it. Our family had one in the home as a child and we would play with it on Saturday night and be in Sunday School the next morning, none the worse for having played around with it. In fact, I can remember even trying to have seances and trying to “lift” people at slumber parties as a teenager. Nothing wicked or evil ever came of it. It was all simply done for fun and entertainment. I do believe there is a spirit world out there – “spirits” as in angels and demons, though; not necessarily the dead trying to still communicate with the living. I think your idea for using it in decorating is cute. And I sincerely doubt it has anything at all to do with your washing machine breaking down. I have heard too many bad things about them. You don’t know who had it before you and there is a reason they don’t have it now. And there is a certain way to dispose of it. I don’t think burning is the right way! Look into it. Here is a site for proper disposal, http://www.angelfire.com/nv/sotalytober/disposal.html. Even though it would “seem” to be cute and nostalgic, don’t do it. I would not sell it or make a penny off it. I would cut my losses now and burn it. There was a time when I would have laughed this advice off, but I have experienced enough now that I can give this advice. That is my two cents. Just the fact that you are asking about this proves your discomfort with it. Many of us have had bad experiences with one of these. I feel that some people are more “aware” of the spiritual realm, and from personal past experience I can tell you this is an open invitation to the spirit realm, which includes evil spirits. The Bible tells us to have nothing to do with this sort of thing. Many people may not understand the history of this so please, don’t think twice, get rid of it. It’s not just cardboard or wood, but the message it speaks. No keep it! One of my treasure hunting regrets.. and I’ve had a few!.. is that I didn’t pick up this really cool ouija board with fabulous graffics! It haunted me (Oops! maybe that is what you’re talking about?!) so I went the following day and it was gone. Snatched right out of the store, it was! Darn! I believe in God and the Bible, in the Bible- demons and Satan is talked of often. This board is just a piece of wood, but it is designed to conjurer- whether taken seriously or not. It was created for an evil purpose, God answers through his word not a board therefore if one was seeking answers from this they would not be searching God. If you are not worried by this you could keep it around, if it bothers you in any way…toss it! I do think they are charming by appearance but….isn’t that the point of things not good for us? Good question, good thought provoking post. Donate it…I feel like tossing it would be just as awful as keeping it!! The only way to have a ouija board is to buy it new – do they even make then anymore?